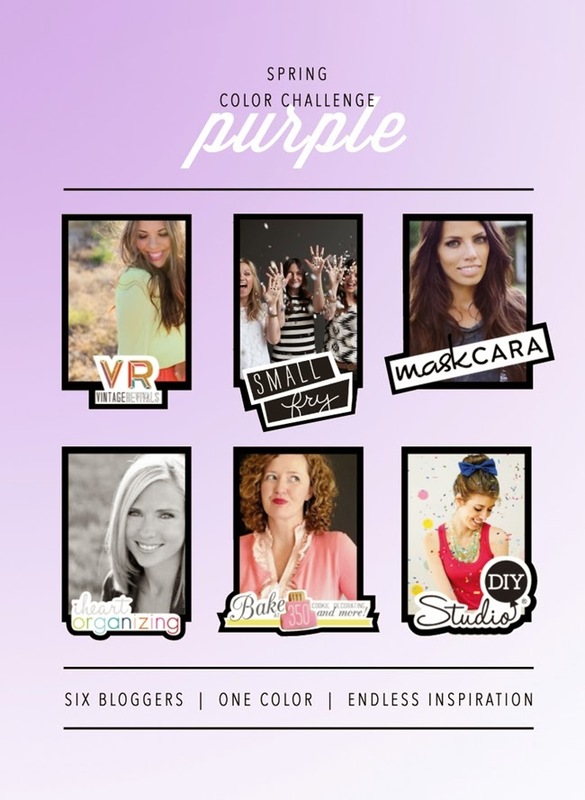 Pantone 2014, Radiant Orchid Paint Chip Cookies: Color Challenge! When Radiant Orchid was announced as the Color of the Year for 2014, I wasn't sure what to think. I LOVE color. LOVE. (I have a bright yellow piano in my family room. Like I said, I love color.) I just wasn't sure "Radiant Orchid" had a place in my life. That is, I wasn't sure until I started looking at all of the tones of Radiant Orchid. It's really beautiful. Maybe it doesn't fit in my house, but a handbag? A pair of shoes? An eyeshadow? Cookies? OK...to make Radiant Orchid royal icing, you'll need a few AmeriColor food colorings. I used equal parts (I eyeballed it, no measuring) Deep Pink, Electric Purple, and Regal Purple. I started with the middle shade, then scooped some of it into one bowl and stirred in more plain icing to lighten it. I scooped some more into another bowl, then added more food coloring for the deeper shade. The cookies are easy. I used my crayon cookie cutter for the long rectangle, and lopped off the pointy end. Before I divided the cookies into sections with icing, I used a food coloring pen to mark on the cookie where I wanted to the lines to go. If you look closely at that front cookie, you can see a little of that food coloring pen mark peeking out from the icing. Shhh....don't tell. Alright, be sure to check out all of the fabulous ladies and their homages to Radiant Orchid (or Lilac). I think it'll grow on you, too! If I had to wear shades of this color every day for the rest of my life, I would not be sad. The cookies are beautiful, and it's such a clever way to announce that a fresh, new season has arrived. Lovely! Love the cookies. You nailed Radiant Orchid! Your paint chips had me fooled until I looked a whole lot closer. I'm a color lover too but you win the prize with a bright yellow piano. Very fun indeed! I have a life sized red London phone booth in my living room. It's a mirror, and I just love it! Love. Love. LOVE these!! I mean looooooooooooove. I love this color! Your paint chip cookies look adorable. You really have to look closely for that food coloring marker and I bet nobody would have noticed unless you mentioned it. Oh. My. Goodness. Bridget. THESE may be my favorite cookies so far. Not because they're complex, but what they mean to me. I work for a personal care company that makes soap for a store you'd probably find in any mall in America (hint hint), anyways, I'm a chemist that works in a lab all day perfectly color matching soap to standards, often Pantones. We LOVE pantones here and I love when the books "expire" and we get to take them home and craft with them. I loved Emerald as last year's Pantone color, because it's my FAVORITE color, but when Radiant Orchid was announced, I was excited because I love purple, too. Our department is actually getting laid off as of this coming Monday, and we will all be sad to say goodbye to Pantoning on the job, but, we will always have fond memories, and these would be the PERFECT going away present for all my coworkers. I can't wait to share this post with them! Oh, Megan! I'm so sorry you're getting laid off. :( I hope this means great things are heading your way in the future! Love this! I did a Radiant Orchid eye and lip look on my blog. I plan on making some cookies soon enough for easter so maybe I'll make some orchid icing for my egg cookies! Super pretty!! I love the colors, and the fun idea!! Love the cookies. What a great idea for a spring brunch! Such a pretty cookie and the perfect choice for a color challenge. You are so clever, Bridget, to come up with a paint chip cookie. I never even knew there was such a thing as "color of the year"!?! i like the idea very much.